The potter is not particular as to the clay he uses and does not go far afield for the finer qualities, but digs it from the nearest place in the neighbourhood where he can get it free of cost. Red and black clay are employed, the former being obtained near the base of hills or on high-lying land, probably of the laterite formation, and the latter in the beds of tanks or streams. When the clay is thoroughly kneaded and ready for use a lump of it is placed on the centre of the wheel. The potter seats himself in front of the wheel and fixes his stick or chakrait into the slanting hole in its upper surface. With this stick the wheel is made to revolve very rapidly, and sufficient impetus is given to it to keep it in motion for several minutes. The potter then lays aside the stick and with his hands moulds the lump of clay into the shape required, stopping every now and then to give the wheel a fresh spin as it loses its momentum. When satisfied with the shape of his vessel he separates it from the lump with a piece of string, and places it on a bed of ashes to prevent it sticking to the ground. The wheel is either a circular disc cut out of a single piece of stone about a yard in diameter, or an ordinary wooden wheel with spokes forming two diameters at right angles. 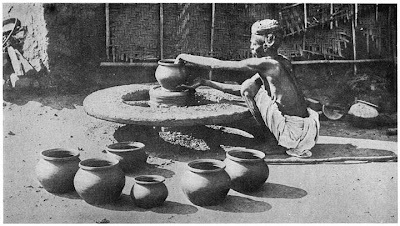 The rim is then thickened with the addition of a coating of mud strengthened with fibre.6 The articles made by the potter are ordinary circular vessels or gharas used for storing and collecting water, larger ones for keeping grain, flour and vegetables, and surāhis or amphoras for drinking-water. In the manufacture of these last salt and saltpetre are mixed with the clay to make them more porous and so increase their cooling capacity. A very useful thing is the small saucer which serves as a lamp, being filled with oil on which a lighted wick is floated. These saucers resemble those found in the excavations of Roman remains. Earthen vessels are more commonly used, both for cooking and eating purposes among the people of northern India, and especially by Muhammadans, than among the Marāthas, and, as already noticed, the Kumhār caste musters strong in the north of the Province. An earthen vessel is polluted if any one of another caste takes food or drink from it and is at once discarded. On the occasion of a death all the vessels in the house are thrown away and a new set obtained, and the same measure is adopted at the Holi festival and on the occasion of an eclipse, and at various other ceremonial purifications, such as that entailed if a member of the household has had maggots in a wound. On this account cheapness is an indispensable quality in pottery, and there is no opening for the Kumhār to improve his art. Another product of the Kumhār’s industry is the chilam or pipe-bowl. This has the usual opening for inhaling the smoke but no stem, an impromptu stem being made by the hands and the smoke inhaled through it. As the chilam is not touched by the mouth, Hindus of all except the impure castes can smoke it together, passing it round, and Hindus can also smoke it with Muhammadans. It is a local belief that, if an earthen pot is filled with salt and plastered over, the rains will stop until it is opened. This device is adopted when the fall is excessive, but, on the other hand, if there is drought, the people sometimes think that the potter has used it to keep off the rain, because he cannot pursue his calling when the clay is very wet. And on occasions of a long break in the rains, they have been known to attack his shop and break all his vessels under the influence of this belief. The potter is sometimes known as Prājapati or the ‘The Creator,’ in accordance with the favourite comparison made by ancient writers of the moulding of his pots with the creation of human beings, the justice of which will be recognised by any one who watches the masses of mud on a whirling wheel growing into shapely vessels in the potter’s creating hands.